First published in the 1950s, Do You Hear What I Hear? is beautifully reproduced for a new reading audience. 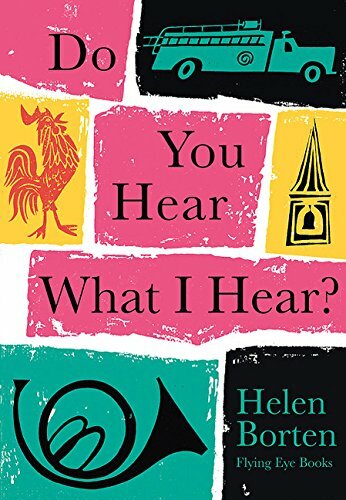 The book encourages readers not just to hear the sounds around them, but to really listen and to think about how sounds make them feel. The text is imbued with rich, figurative language and the retro illustrations, printed in layers using 4 spot colours, combine to create the perfect blend of words and image. There is really only one response to this book and that’s to go for a sound walk. Listen to environmental sounds. Talk about them. Think of words to describe them and how they make you feel. Draw pictures of them. Then use the pictures as the score to compose your own music to tell a unique story of your walk in sound. Music for young children doesn’t get any better than this. This is an outstanding resource for young readers, covering, as it does, all the basic elements of music (dynamic, pitch, volume, texture, timbre and duration). All the foundations of music are here, presented through words and images in a way that even young children can access. My only reservation is that the difference between rhythm and beat are not defined, but that should not detract from seeing this book as a must for every KS1/lower KS2 classroom. It is, quite simply, an outstanding music lesson between the covers of a book.